Where in the World is Mrs. Fucoloro? : Playing the license plate game with 26 days to go! Playing the license plate game with 26 days to go! Waiting for my trip to Italy, I am playing my favorite game. The license plate game runs from Memorial Day weekend until Labor Day weekend. My friends and family have been playing this game for more years than I can remember. The goal is to find all fifty states. Rules include only plates found in your metropolitan area are eligible. As of today, I have 34/50 states sited. I hope this year is better than last year--the worst year for the license plate game EVER! 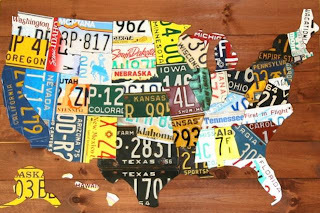 I like the image of "USA Map" created by Aaron Foster using authentic license plates. Around my apartment just yesterday I saw both Hawaii and Delaware. There is also a North Dakota floating around. We don't get anything southern in Denver, though. I don't know if I have ever seen an alabama here. I saw Delaware yesterday, too! I still need Hawaii and North Dakota. I haven't seen Mississippi or Louisiana, yet. Isn't that weird?